Our very own Sandwich High School Choral Music Department and Knight’s Theatre Company has two great events coming up in the beginning of March to kick off Spring! On March 3rd, Sandwich Soul will have their very own concert at SHS Theatre at 7:00pm. Tickets are $10.00 for adults and only $8.00 for students. And on March 11th, Knight’s Theatre Company will be hosting a Community Sock Hop Event, celebrating the 50’s in honor of our spring musical – Grease! The event is held at the high school from 5-9pm, and is for all ages. Please print and save and POST the flyer below and invite all your family and friends!! 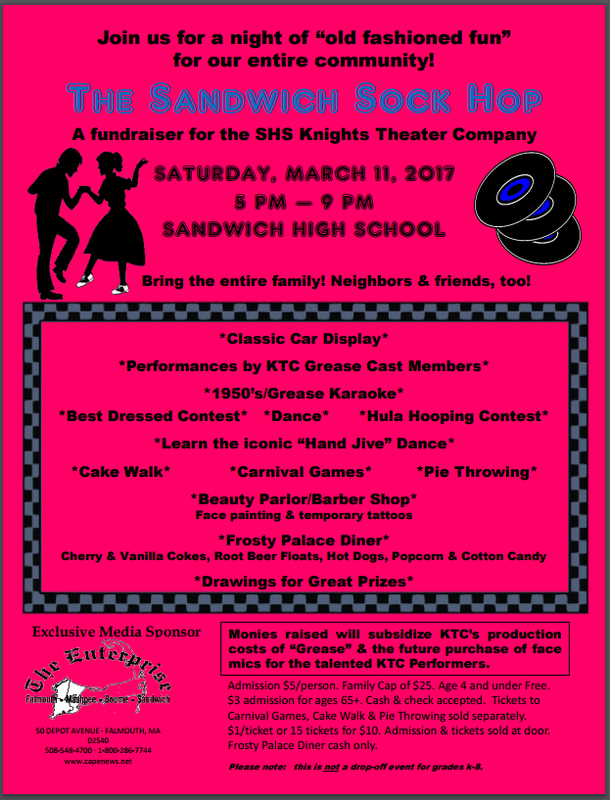 The Sandwich High School Knights Theater Company is performing “Grease” as their Spring musical and just prior to these performances, they will be holding a very special fund raiser: The Sandwich Sock Hop on Saturday, March 11 at Sandwich High School from 5-9 pm. Monies raised will help subsidize near-term and longer-term improvements and enhancements for the talented young performers and tech crew who are members of The Knights Theater Company under the extraordinarily gifted directors, Kevin and Melinda Lasit. Some of these improvements and enhancements include renting a Grease Lightning stage car for use in the Spring musical and eventually purchasing high quality face mics for use in future productions. Admission is $5/person. Family cap of $25. Age 4 and under are free. $3 admission for ages 65+. Tickets to carnival games, cake walk and pie throwing sold separately. $1/ticket or 15 tickets for $10. Frosty Palace Diner is cash only. This is a wonderful opportunity to bring our entire Town together for an evening of togetherness, connectedness, and community!